When Sean McElrath entered high school in DC, he knew he wanted to be a doctor. Today, three years later, McElrath is announcing seed funding led by Fortify.vc for a startup called Hallway, which aims to change the way students share information. It started when McElrath, a self-proclaimed “techie” who follows startup blogs, signed up for a few business clubs at his school, the selective Thomas Jefferson High School for Science and Technology. Unfortunately, they didn’t talk much about entrepreneurship. “I felt like they weren’t really getting a lot done,” he recalls. 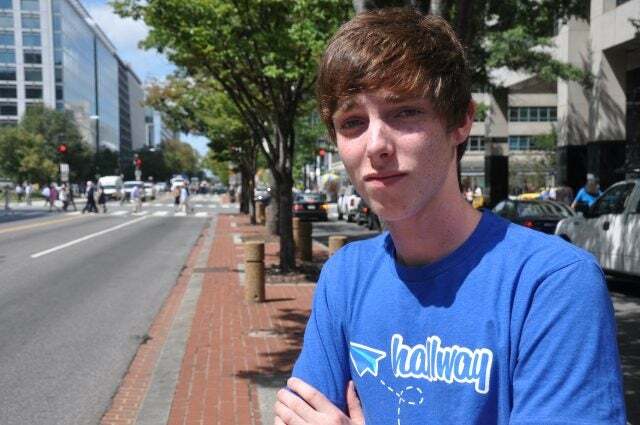 Inspired by startup accelerators, he started an entrepreneurship club called InvenTeam. Mentors like Evan Burfield of Startup DC and Jonathon Perrelli of The Fort accelerator signed on, and they hosted cofounder dating events, pitch competitions, and guest lectures. After tirelessly putting together the cofounder dating, McElrath finally shared his idea for Hallway with an inquiring Burfield. Then followed a bunch more discussions, wireframing and feature planning, and some ad hoc recruiting – McElrath would duck into the computer systems lab at Jefferson and said, “Hey guys, I have this awesome idea. Who’s the best coder in here to help me make it a reality?” Joined by five of his teenage peers, Perrelli invited him to spend the summer before senior year at The Fort. During the summer, the Hallway team tested their product with 120 students from Jefferson. Hallway helps them share notes, questions, and videos, and eventually hopes to connect them to learners around the world. They are honing an algorithm that predicts which posts are relevant to you based on the classes you’re taking, what you’ll probably be learning next, and what areas you’re struggling in. Today, McElrath is opening up Hallway to all the students at Jefferson, just in time for the fall semester. He and his team also signed up ten “ambassadors” from high schools around the country to send out invites and drum up interest online. With college applications and senior credits to finish, McElrath will be leading his team over the Internet, keeping a long to-do list, and chatting with students in the hallway about Hallway. After discussing it with his parents, he plans to apply to universities, see how Hallway grows, and consider taking a gap year before college.